Every month or so, we are introducing some of the great people involved with Broken Spoke, finding out what gets their wheels turning and keeps their freewheels ticking. Up this month – Kiro! 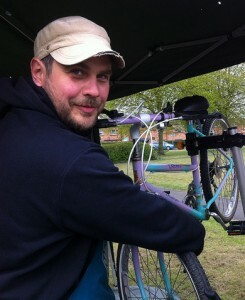 Cycle instructor and workshop mechanic. What got you involved with Broken Spoke? I used to volunteer at Crisis Skylight, where Elle was running a course, and I started volunteering on the course, which was a build-a-bike course. 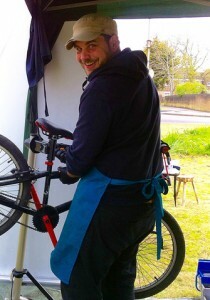 Since then, I’ve been volunteering in Broken Spoke and getting more and more involved. I do remember having a bike when I was 5 but can’t remember what it was. But the most memorable bike I had was a bike I bought when I was 16, it was a Russian 10-speed racer bike called “Sputnik”, with tubular tyres, and drop handlebars, the whole thing. I had to work the whole summer to save the money and buy it myself, so I definitely remember this bike the most! Everybody else was riding town bikes, and very old chunky, steel bikes, and I had a race bike, and suddenly nobody could keep up with me! A bike which works is a good start! And which looks good. I don’t have a make or model that I look towards, but a steel touring bike sounds good. Though I’ve got a bamboo bike, and that’s a good option. The thing about bamboo is that it is ecological, as a material. What’s the soundtrack when you are working on bikes? I like listening to someone else’s choices of music – whatever I used to listen to, I’m bored of it. In the workshop we have an internet radio station, all the way from France, and their choice of music is nice. What fix do you enjoy? What fix do you not enjoy? What is your favourite bike ride (or what is the best ride you’ve been on)? What would be your top tip for someone starting out? Use it, cycle on it, don’t forget about it. And look after it, of course. Every bike, even the most expensive needs maintenance, oiling the chain, pumping the tyres, and 90% of things that can go wrong can be prevented by maintenance. What do you think is the most challenging thing about bicycles at present? 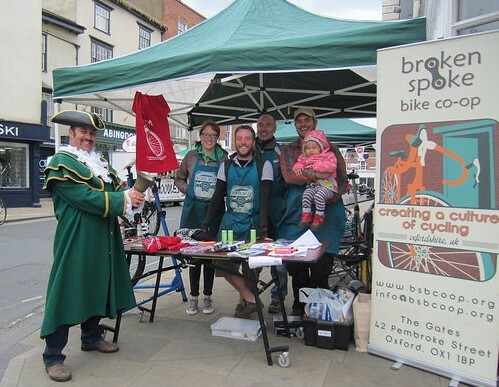 In Oxford and in Britain, bike culture is growing, and establishing itself, so there is a bit of confrontation between road users, and lots of misunderstanding. And this – establishing the bike culture and making it more popular – it’s a good challenge. Introducing people to the idea of using a bike and not getting on a bus or driving a car. And also, what we do with the cycle training, where cyclists learn a bit more about the cycling environment, and how they can use it more safely – and understand that cycling is not dangerous – cycling is a very safe activity, but it helps to make the right choices on the road. What is your opinion on Critical Mass? I think it’s an absolutely brilliant idea, and when it works, it’s very enjoyable – people taking part, having a great time, and people watching enjoying that. But it’s in the name really – critical mass – if there is critical mass then it works, and if there isn’t then its going to be a struggle for everyone. A few attempts to start it seem to have failed – there are not enough people attending. Maybe there is some sort of formula you can use – if a town has got such and such a number of people living in it, and riding bikes you can start a critical mass!